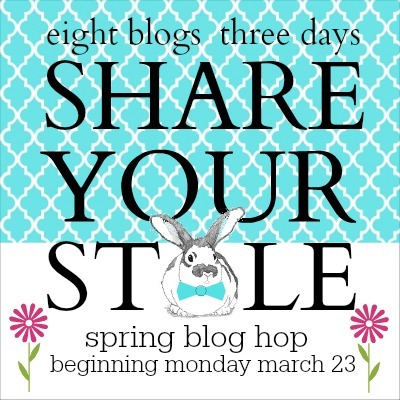 Share Your Style Spring Blog Hop! This week all eight of us will be sharing some fresh new Spring Inspiration and we hope you'll share what you've been doing to transform your spaces for this brand new Season. 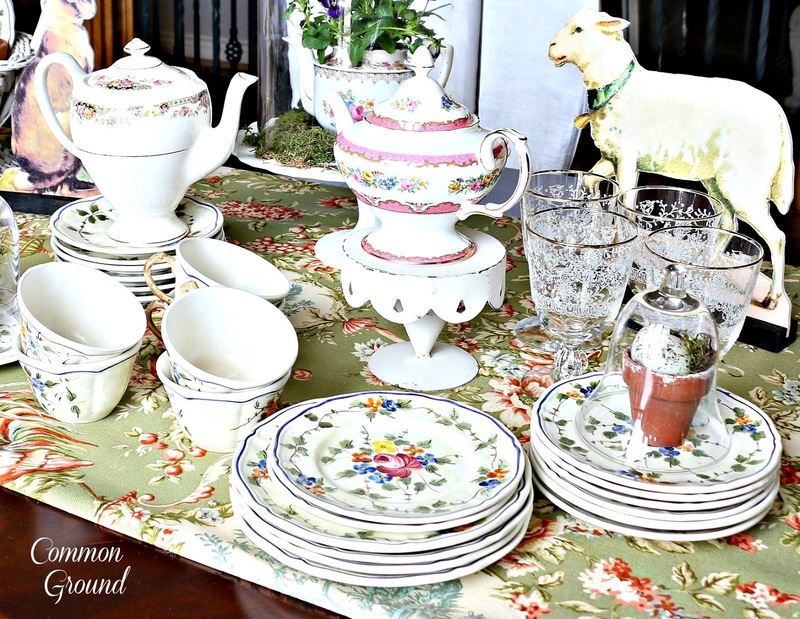 It all started with this wonderful multi-colored Waverly Toile fabric I found for a new table runner in my Dining Room. I knew I wanted something "Green" for Spring, but wasn't sure which direction I wanted to go. 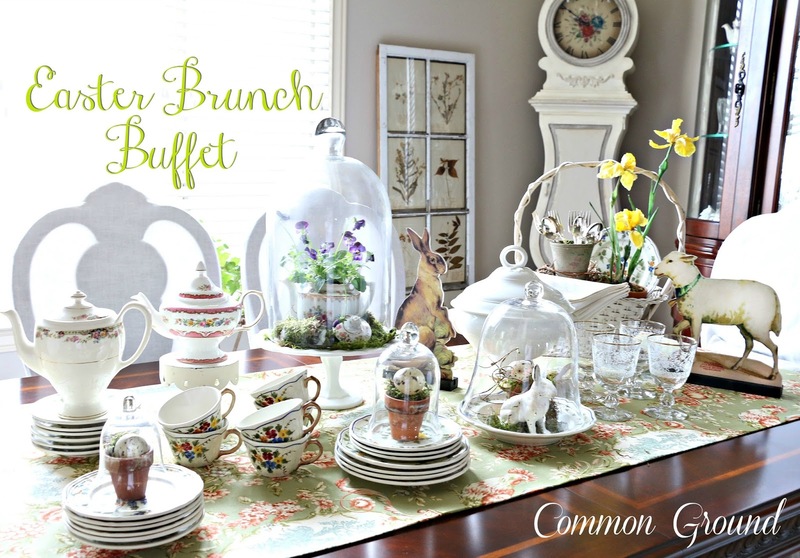 Once I saw this, I knew it would make the perfect backdrop for a Country French inspired Easter Brunch Buffet. 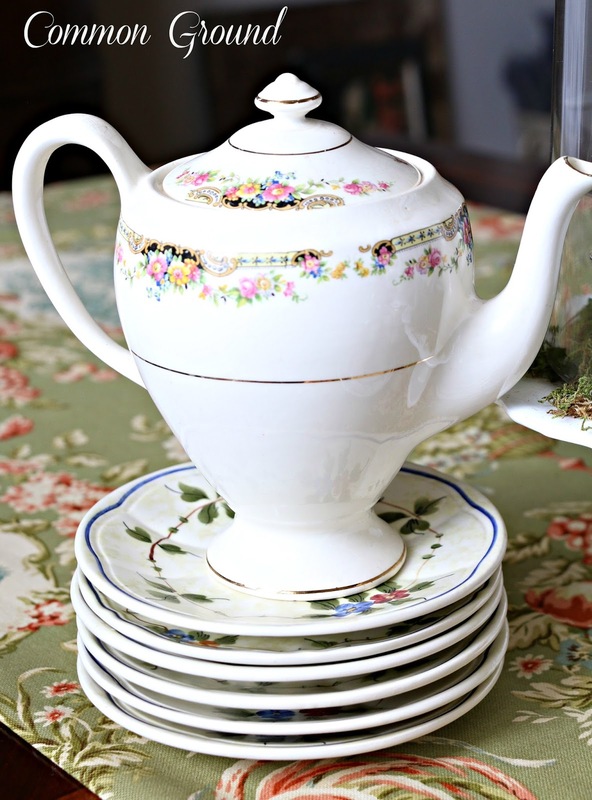 I brought out my wedding "china", which isn't really china, but French Faience. Faience is an earthenware tin-glazed pottery, hand painted and kiln fired. Some of the individual flowers are almost 3-Dimensional to the touch. 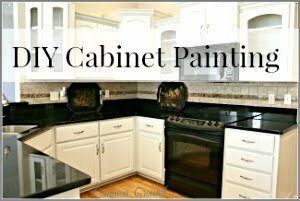 They vary in depth and hue, as each one is painted by hand. 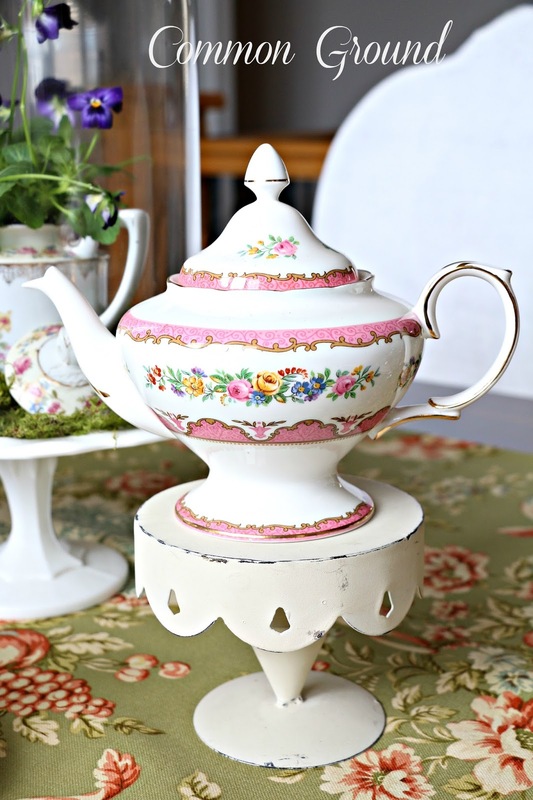 I wanted to mix the bright handmade florals of the Faience with my small Staffordshire, English teapots and a few cloches. 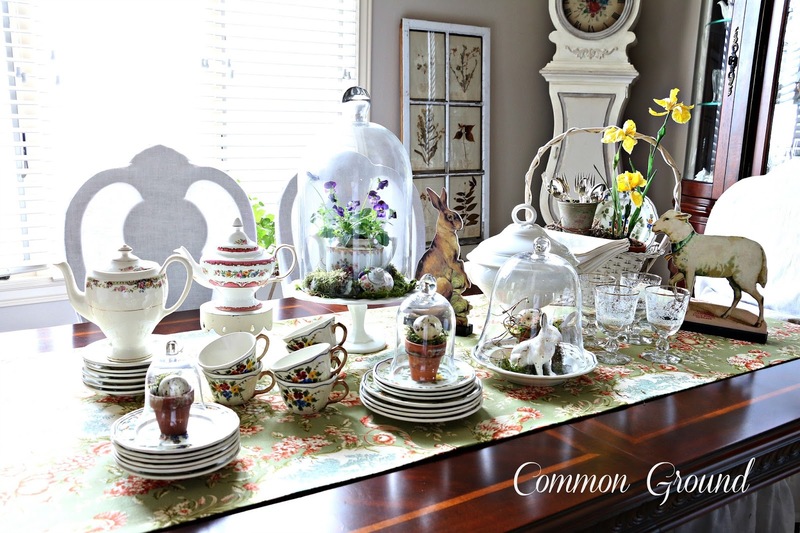 It's perfect for a vintage inspired tablescape for an intimate Spring Brunch and Tea. As you can see I've invited a few special "friends" to the gathering. 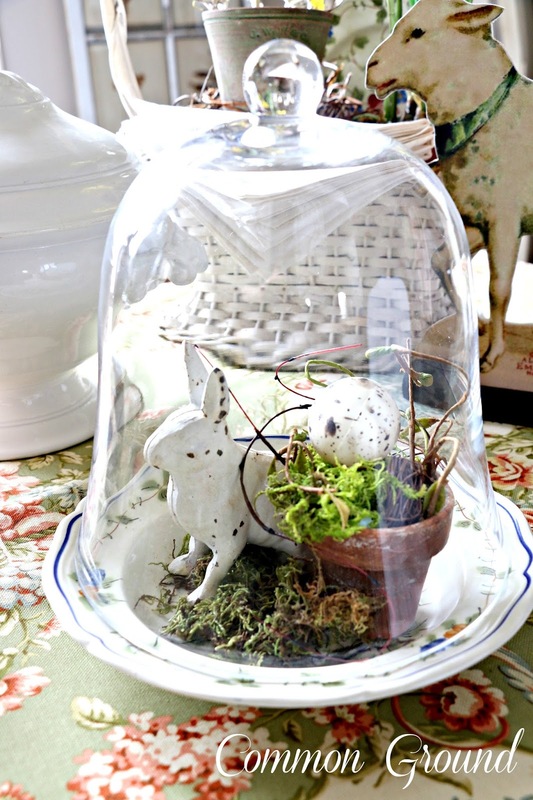 out my Cloches for "Spring under Glass". 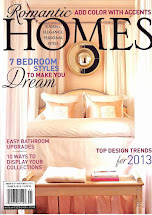 I think I must have "styled" all these pieces one hundred different ways. But it was so much fun, starting out with just a fabric piece and letting it choose the plates, flowers, teapots and baskets. have been creating for the Hop! Tomorrow, Lynn, Kelly, and Martina. and 6 PM Central to join in on the Party. 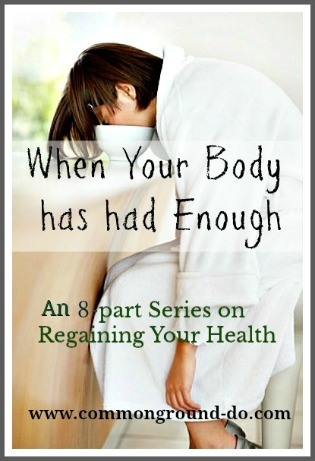 You can link up to 3 Spring Posts, past and present. 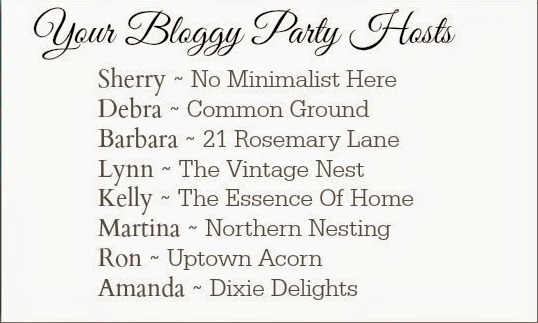 and bring it on over to Share Your Style Spring Blog Hop. Hi Debra! Oh, I love your new runner and the fabric is truly gorgeous! Your dishes are so pretty too. Love those little darling standup animals too! They look vintage. hope you're doing well. Gosh, I love that Waverly fabric, Debra! Your faience, the tureen, the cloche, and wood (?) animal cutouts in front of the basket- so great. Oh how completely charming Debra! 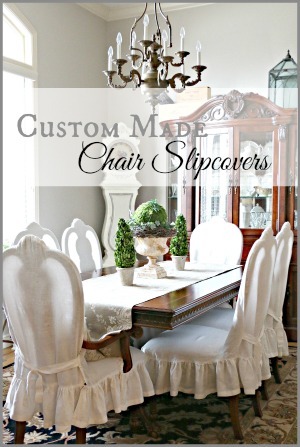 I love the fabric of your new runner and your special guest add such a beautiful touch of whimsy. Everything looks absolutely magical! Debra, How beautiful!! I love the runner fabric and your faience is gorgeous. 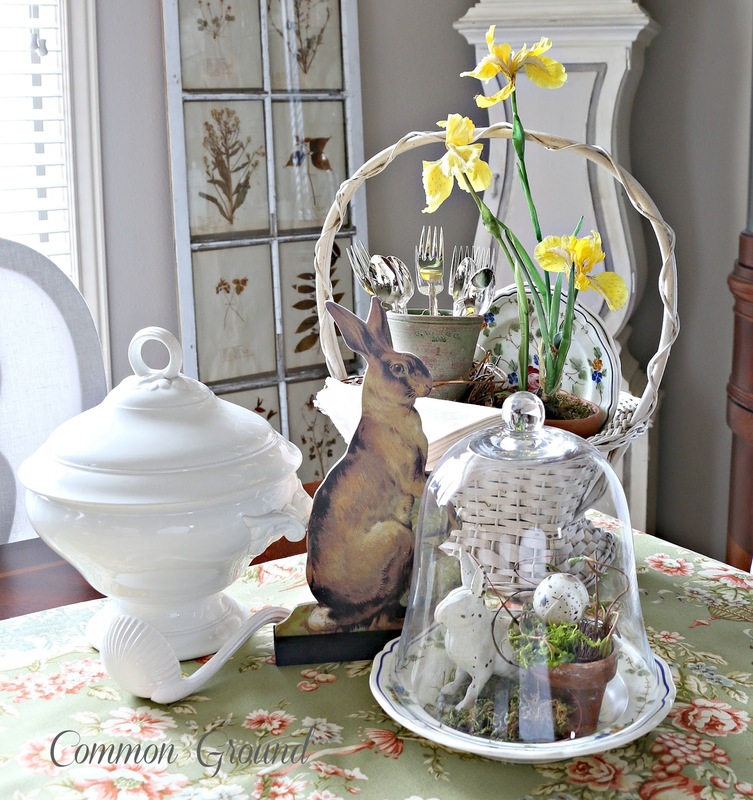 Everything creates a fabulous Spring table. Spring PERFECTION! 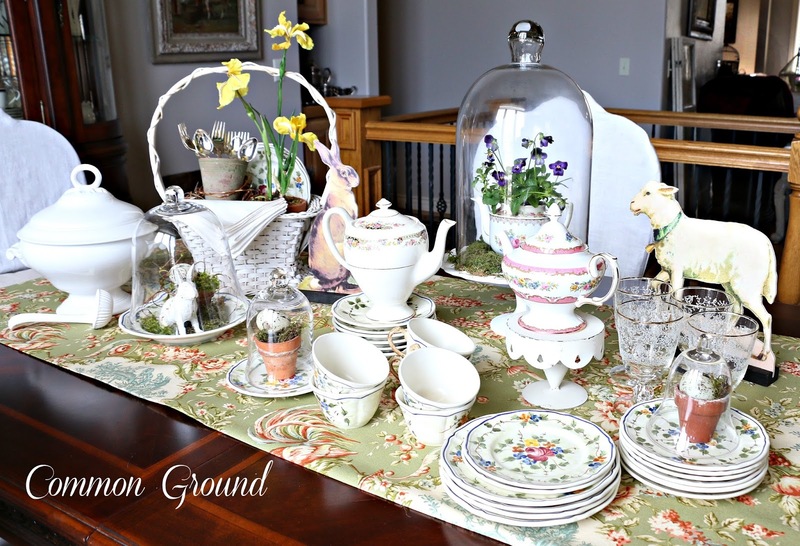 Lovely tablescape Debra! 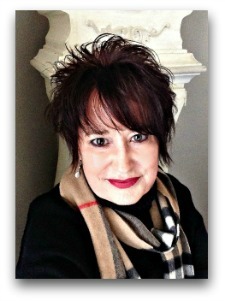 I love your runner fabric Debra it sets the perfect stage for your beautiful tablescape! I love that fabric and all of your beautiful spring inspiration! Debra, your table is gorgeous! Debra, your things are gorgeous. I love the small terra cotta pots with the egg under the cloche. 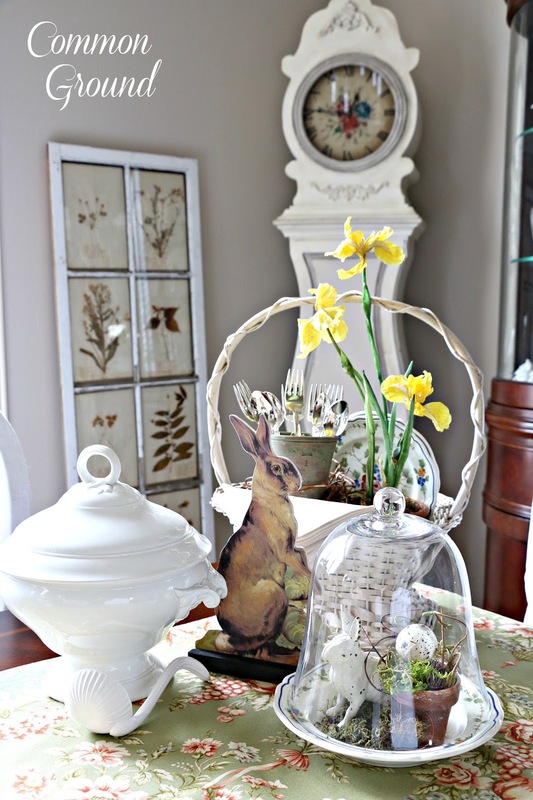 What a lovely vignette of Spring time pretties! 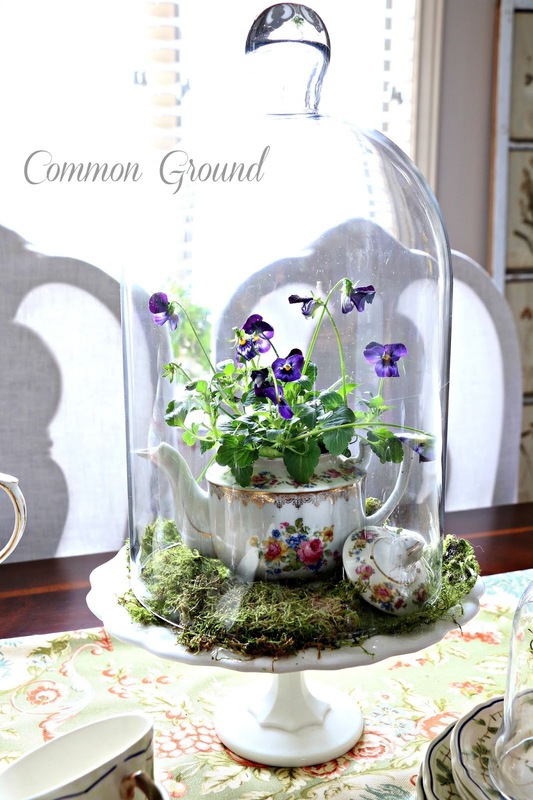 I love how you used those pansies in coffee cups under the cloches. Your Spring time animals add just the right "cuteness" too. 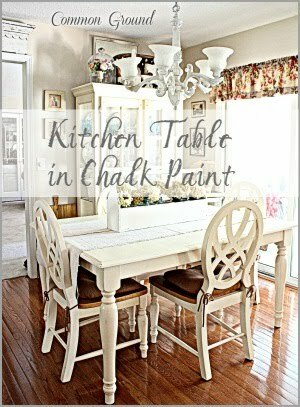 Such a pretty table scape! 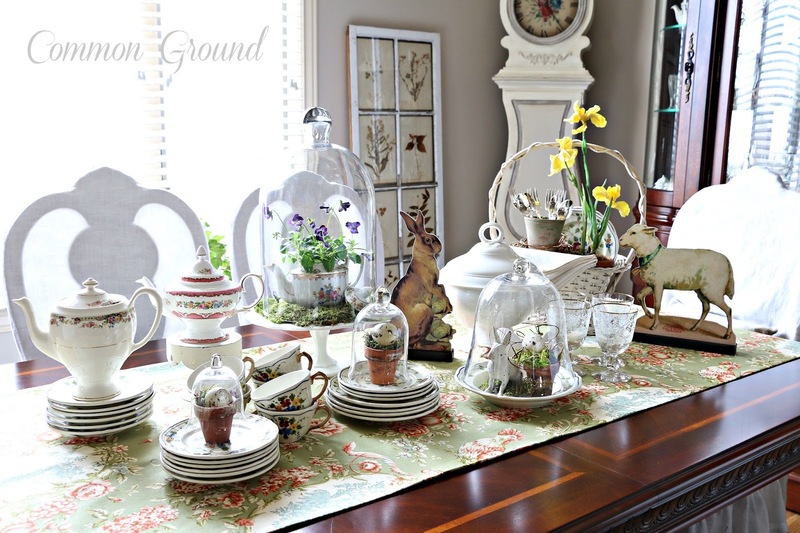 Love the fabric, your faience China, that beautiful ironstone, your mora clock, oh and all the cute easter touches! Its such a great mix Debra. I love toile and the colors on your fabric are so fresh and just perfect. 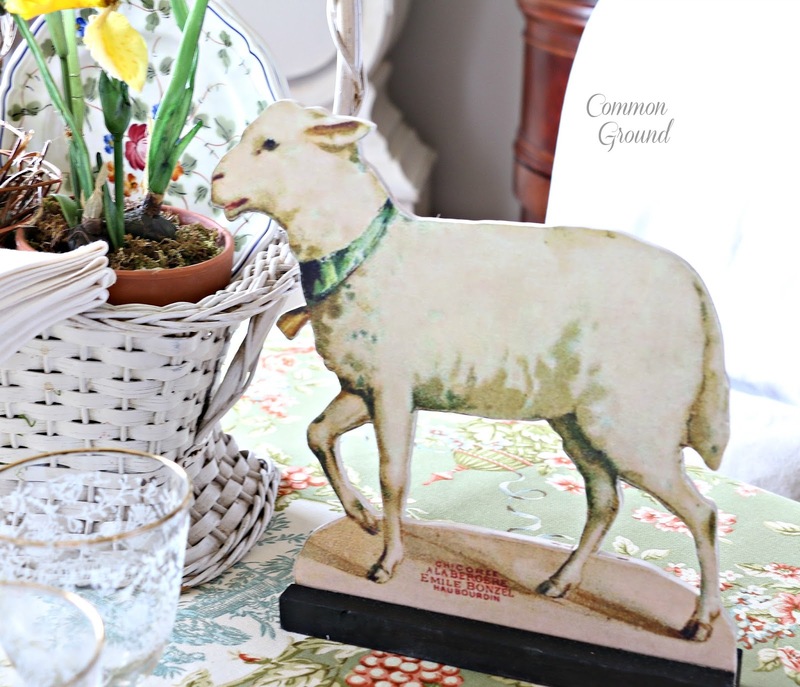 Vintage easter lamb print and ironstone and old fashioned easter basket are my favorite accents on your tablescape. Happy Easter! The fabric in your runner is truly inspiring!!! 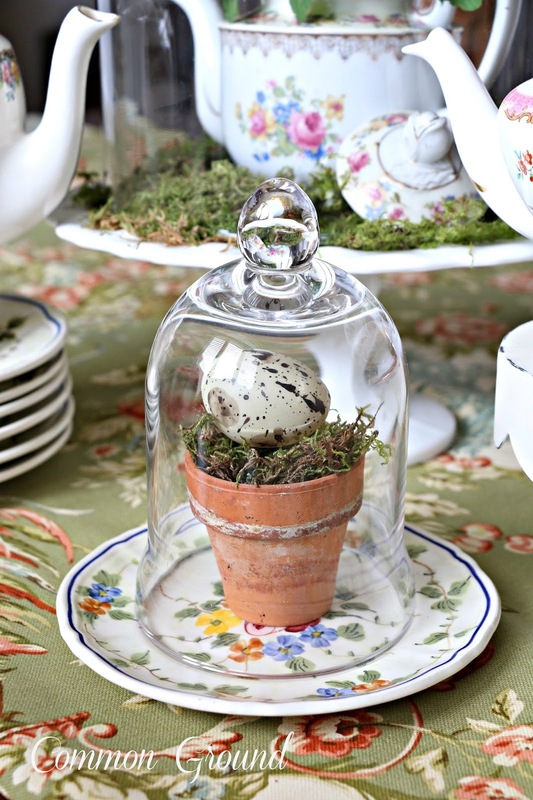 I adore the elegance and yet, whimsical touches to your French Country Inspired Spring Brunch!!! Your French faience china is exquisite and unique, indeed!!! 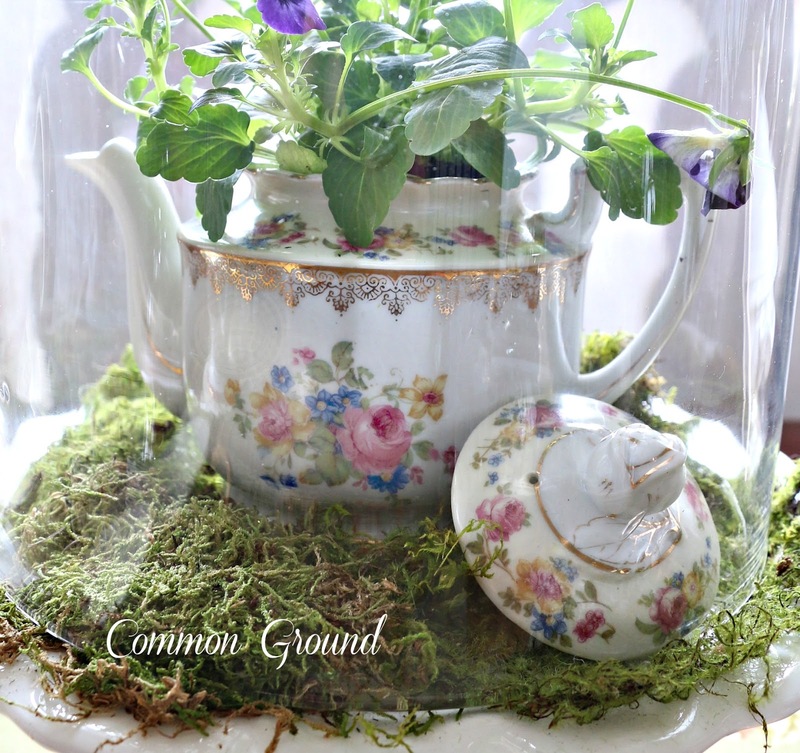 Love the purple pansies beneath the glass cloche!!! 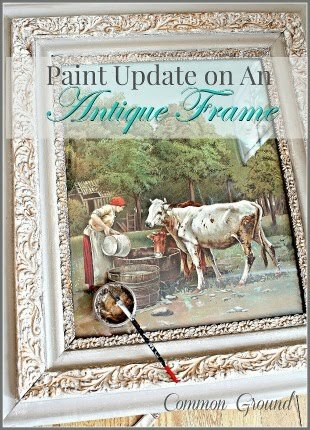 And finally. . .our weather on the Prairie is cooperating for an amazing Spring Day to complement your tablescape!!! This is all so lovely, Debra...and your new runner is beautiful! Your table is so pretty! I love all of the eye candy. ha! Love the tablecloth fabric too. it is gorgeous Debra! I love your dishes and you can never go wrong with cloches and purple pansies. I love your collection of Spring friends and that fabric is fabulous! Your tablescape looks BEAUTIFUL Debra!! Love love your toile runner!! Debra, your table is exquisite. 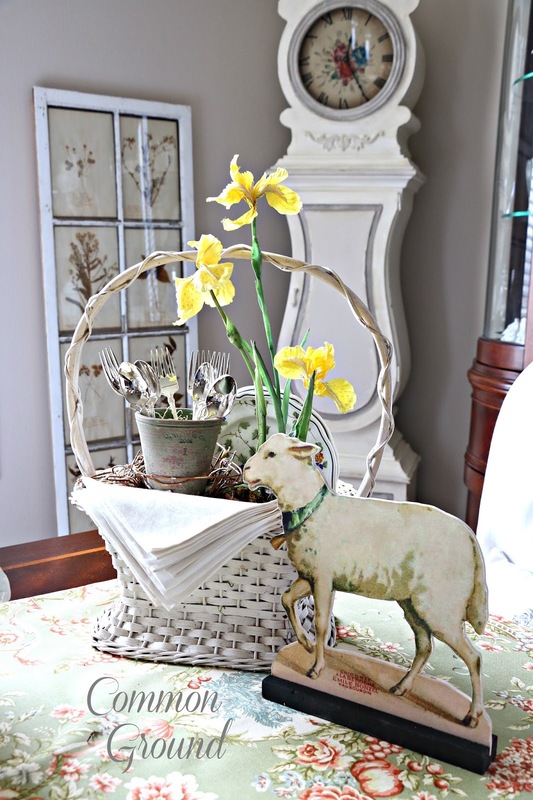 The toile textile is a perfect base for this spring table. I'm enchanted with your wedding faience. Does it have a mark? It is beautiful! I'm crushing over your basket. I've looked for one in this shape. 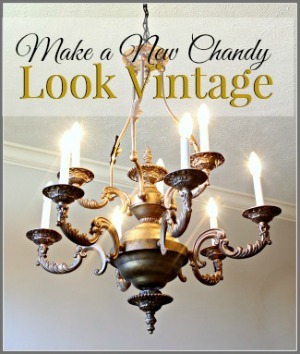 Is your's vintage? All the details are the perfect touch for Easter. Off to add some pins to my own inspiration board. Thanks! It's lovely, Debra! I'm a huge fan of toile, so I love the tablerunner. And your pansies under the cloche are beautiful! So very beautiful Debra!! !...Just made my heart sing!!.. Oh, how lovely! 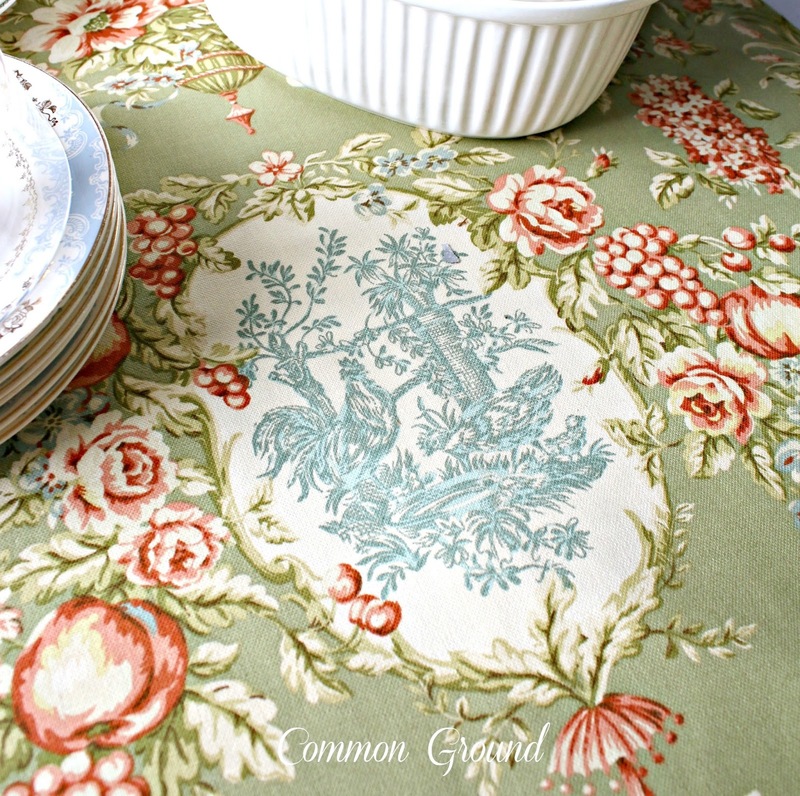 The table runner is gorgeous, and your faience is perfect. I love color and flowers! My oh my, this made me know I will be doing a fabric search! Gorgeous dishes and accessories as well. Happy Spring ! What a beautiful display! 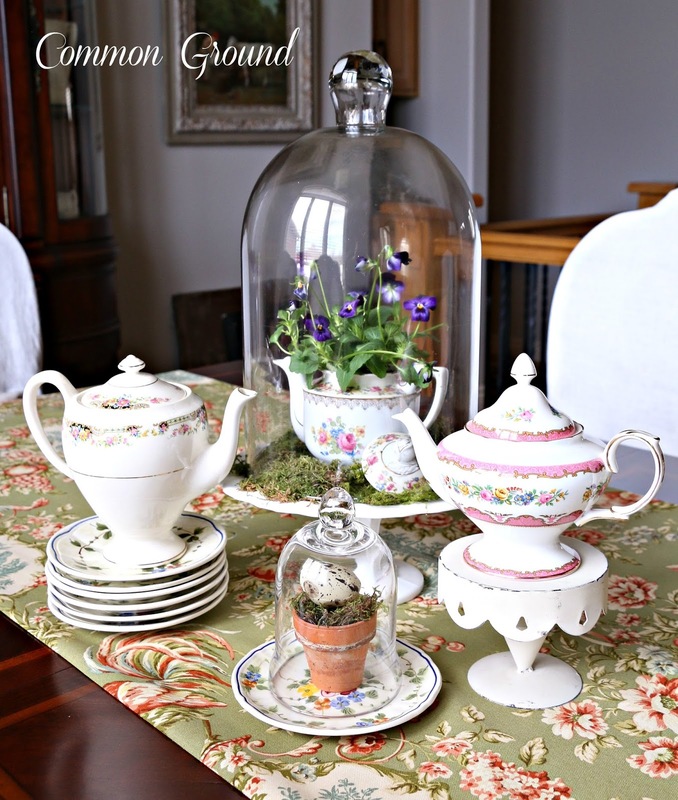 Love the fabric runner, the tea pots and the cloche! Your wedding china dishes are wonderful! 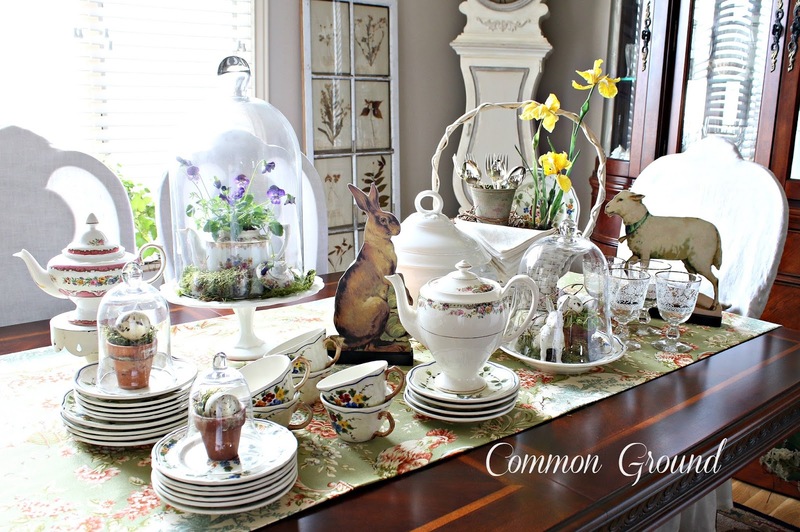 Love everything about this tablescape, it is the essence of Spring. 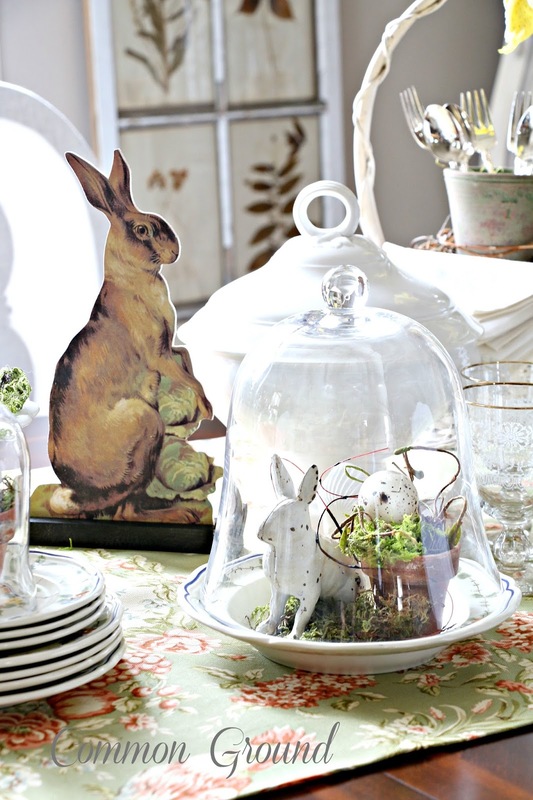 Really love the 'Spring under cloches', those big glass cloches must come out again and again. 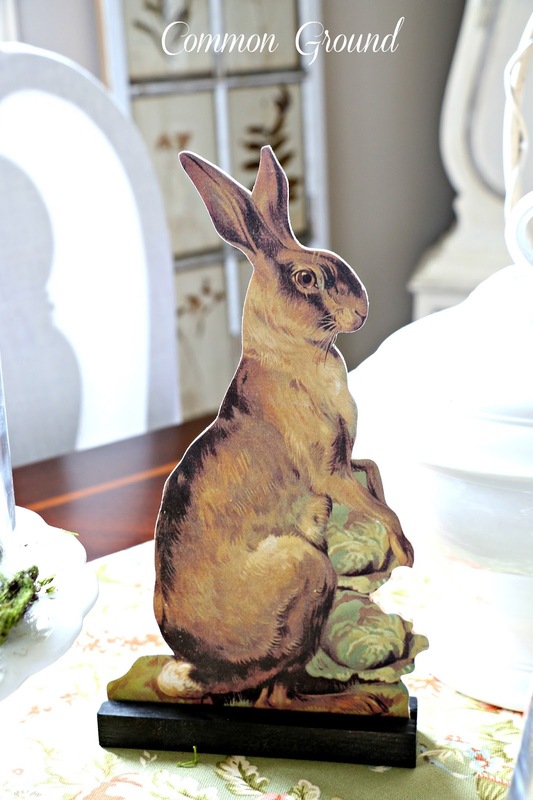 You have some lovely Easter decorations, have you collected over the years?